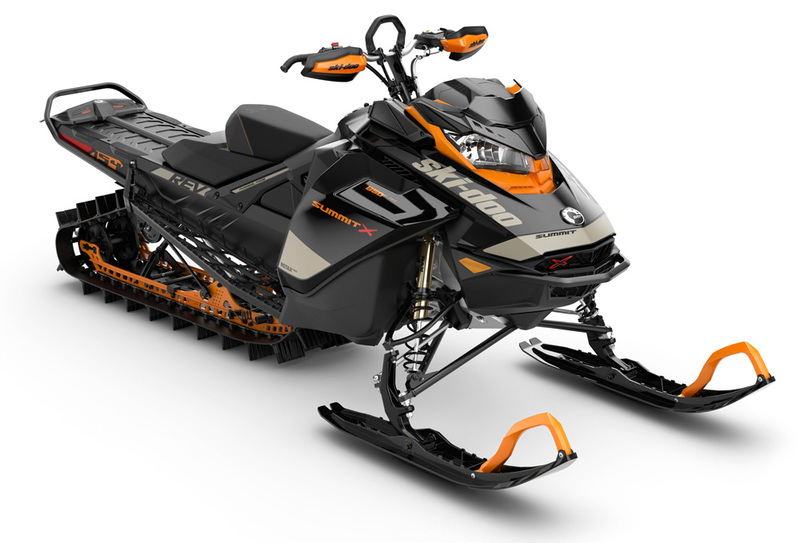 The 2020 Ski-Doo Summit X Expert is flawless. It is stable, yet agile. It is secure, yet flickable. It is powder hungry, yet mogul savvy. It is nimble, yet certain on its two skis and track. It is a nearly perfect mountain snowmobile as we’ve ridden to date. 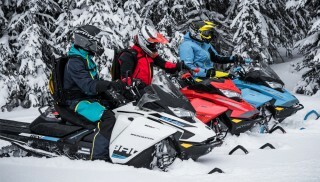 The Expert is the Welterweight competitor to Polaris’ 2020 AXYS RMK KHAOS. We dare wager a bet. The Expert, in our opinion, is more sure footed – confident – than the KHAOS. Its surefootedness will give the Expert the stance to lean into the KAHOS and deliver a right upper cut followed by a left roundhouse. We don’t think the KAHOS will fall, but it may wobble a bit at the knees. We look forward to the day when we drop these two sluggers inside a high mountain ring and let them have it. Boom shaka laka boom. 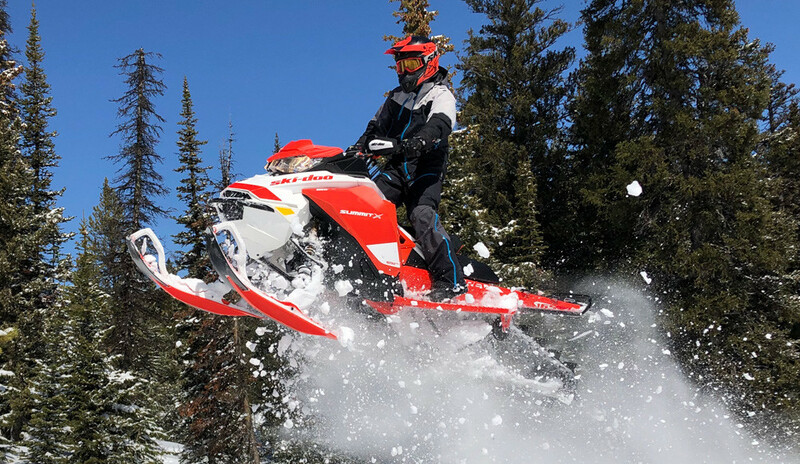 When the fourth generation REV chassis (G4) from Ski-Doo made its debut, we did not understand then how good and successful the G4 Summit would be. Well, we sort of knew, but did not fine tune our crystal ball to see how popular it would become. For our introduction to the 2020 Ski-Doo Summit X Expert, owner and lead cowboy of Ride Rasmussen Style, Bret Rasmussen, “The Professor,” invited Snowmobile.com to spend a day with him in his “Schooled” clinic; a classroom we like sitting in and being taught more than waiting out 55 minutes in Philosophy 101 with a stuffy ethics professor. Boring. How our ride day began. Bret Rasmussen’s modified Summit X, and the 2020 Freeride and Summit Expert. We had the best of the best on this test day. Not the difference in height on the handlebars, with the Freeride being the tallest. We find it ironic how the Professor will share his expertise aboard an Expert. Now the details. The Summit Expert is a G4 Summit X, but shaped to be for those who relate their riding style to Rasmussen’s or fellow athlete, Carl Kuster, to name another. In the belly is the famed 850 we’ve praised since its beginning. The two-stroke twin cylinder motor kicks about 165 horsepower at sea level. At the rear is the famed tMotion rear suspension, a proven rear skidframe for mountain use. 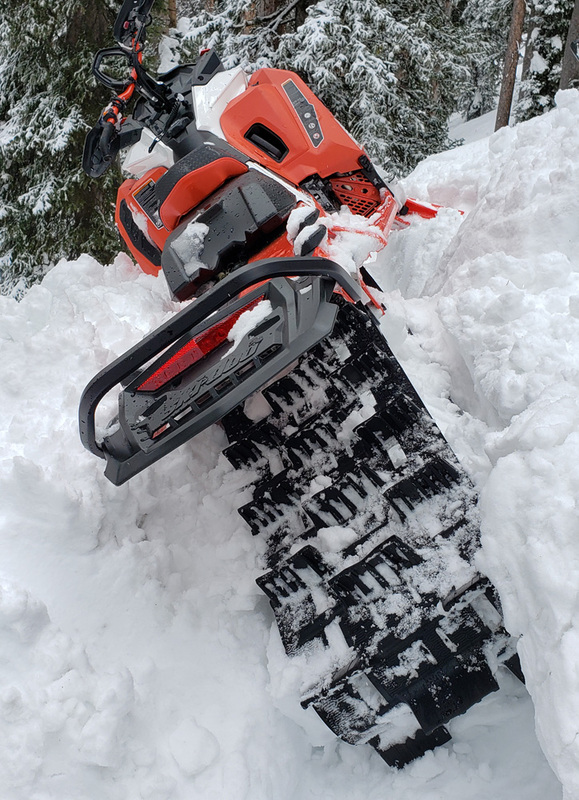 Wrapped around the tMotion is the 16-inch wide Powder Max Light Track with FlexEdge technology. Lug height is 3.0 inches, standard. Also standard for the 2020 Ski-Doo Summit X Expert is the tMotion Limiter Strap Adjuster, where you, the rider, can lengthen or shorten the front limiter strap without reaching under the tunnel to either lockout a shock or loosen the bolts, shorten or lengthen the limiter strap, and reinstall the bolts. (Which no one did.) 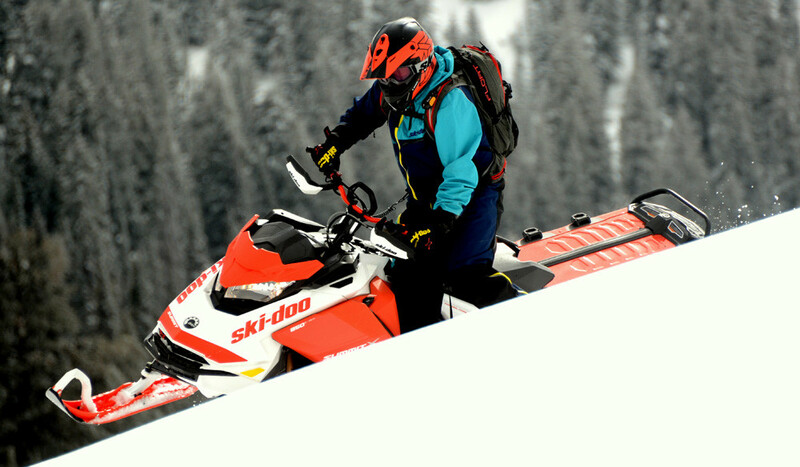 Here, you can quickly and easily adjust limiter strap length for desired ski lift (nose light) or minimal ski lift (nose heavy) without crawling under the sled. Two settings only: short and long. The limiter strap adjuster is mated to the tunnel, left side, half way back from the toe well. The flush-mounted lever does not hinder foot and leg movement. This is a boon for the serious and lively driver who is a mountain wrecker. Testimony here: it works and is wonderful. Under the nose is the RAS 3 front suspension. The front suspensions bounds on Kashima coated HPG Plus shocks with lightweight springs. What is Kashima coating, you ask? Kashima coating, in tech geek speak, is a proprietary hard anodizing processing that the Miyaki Company of Japan invented, where lubricating molybdenum disulfide is deposited via electrical induction into the billions of micro-pores on the surface of hard-anodized aluminum. This process delivers better lubrication and less abrasion and wear. Conventional hard anodic film is normally porous with low to moderate wear resistance – there are more chances of abrasion and wear, caused by lubrication failures in high pressure, or vibration. 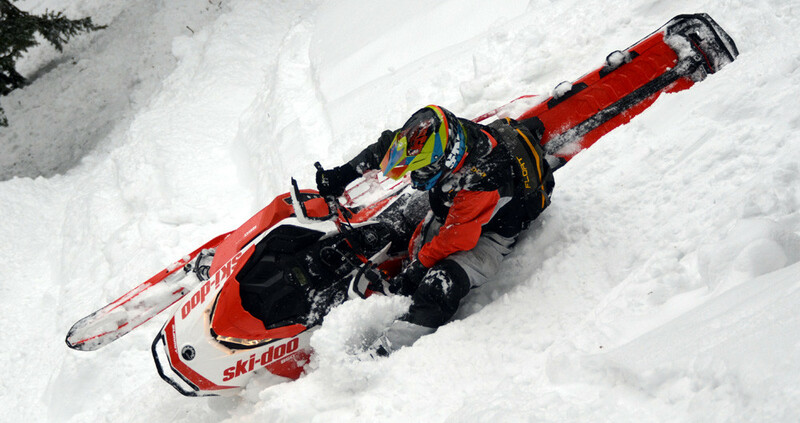 In snowmobiler speak, the shock’s internal components are smooth and slick. A modification to the ski spindle keeps the ski flat, meaning, the tip or the nose, does not flip up when bridging trenches. According to Ski-Doo, the “revised ski spindle and ski stopper [is] for more predictable handling and a confidence-inspiring ride on steep sidehills and rough terrain.” Over the years, the G4 Summit, especially the 146 and 154, in the right conditions and settings, specifically when making a sidehill cut across a steep slope where the snow is tracked up and trenched, would have negative feed-back up through the bars, and too, the Summit would want to move from a horizontal plane to vertical (climb) while at the same time, washing out. The 165 was not prone to this as much and most definitely the 175 at all – due to its track length. The new ski spindle and rubber boot mount keeps the Expert’s skis flat. The goal is to prevent tipping up on sidehill cuts and when encountering an obstacle. Given that, the new ski spindle and rubber plate is designed such the ski does not porpoise up and down thus keeping the sled in the driver’s wanted direction. Furthermore, this new system, when in the unfortunate case the driver plows the Expert’s nose into a gully bank bringing the Expert to a stop, a ski or skis, the Pilot DS 3, will not point straight up; this is also important in deep snow on a flat plain, when crossing an obstacle or a trench, the Pilot DS 3 skis will stay flat and help bridge the chassis over the obstacle or trench. All this mentioned above are huge gains in handling coming from a small change – an improvement. The 2020 Ski-Doo Summit X Expert’s handlebar post is 4.7 inches in height. 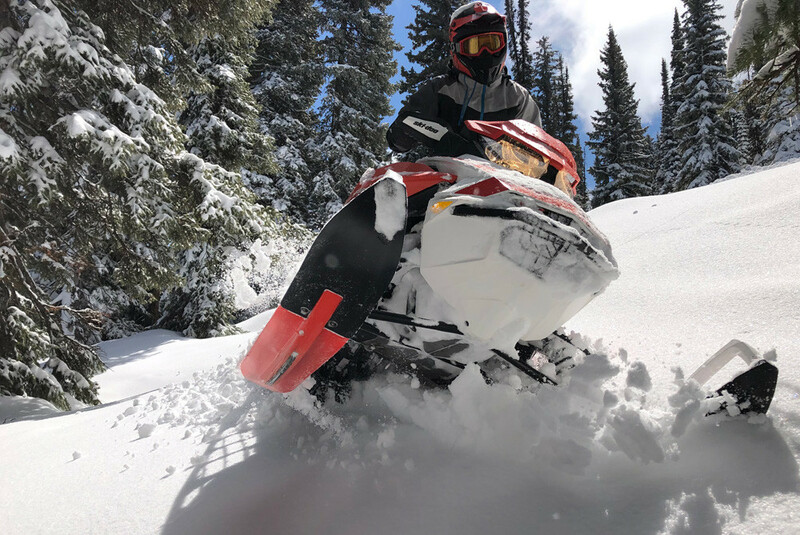 The low post over that of a Summit X, an SP and the Freeride, helps keep the driver properly positioned over the track drivers and closer to the motor – this is all part of balancing the snowmobile. The handlebars’ center mountain strap is lower and narrower than the Summit X, SP and Freeride, this low and out-of-the-way center pull strap is for just that: to be low and out-of-the-way. In full view, you can see the shorter handlebar post, full extruded runningboards and the short FORTY7C seat. In concert with the low post and out-of-the-way center pull strap is the Expert’s seat, known as the FORTY7C Performance Seat. 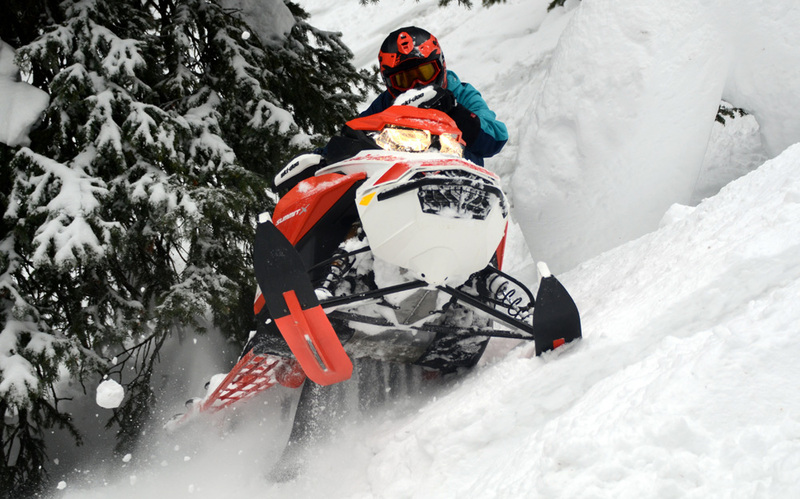 The seat was designed by Ski-Doo backcountry expert and athlete, Carl Kuster. This unique seat allows the driver to be freer and quicker to move around the sled’s play area by being lower, narrower and lighter than the stock Summit seat. We proved this, and this is all true. For the two Expert models, 154 and 165, they rely on the tunnel from the Summit shorter than it. Meaning, the 165 Expert uses the tunnel from the 154 Summit X, and the 154 Expert uses the tunnel from the 146 Summit X. The shorter tunnel drastically cuts down snow recirculation. Long tunnels and deep lugged tracks, the staples to mountain riding, pulls snow from the surface and rotates it around and back to the track drivers. When recycled snow meets fresh snow at the approach angle, two events occur: 1) the motor works hard to rotate the snow, while attacking fresh snow at the same time, and 2), the recycled snow is not dense or sticky like fresh snow, and the track has a hard time making good use of it. The shorter tunnel gives the Expert the chance to spit out the snow and not recirculate the horsepower and momentum-robbing used snow. At the tunnel’s end is a short snow flap. The minimalist snow flap greatly reduces the chance for snow to take a ride atop the track back to the track’s drivers. Short tunnel and short flap gives the churned snow an escape route. 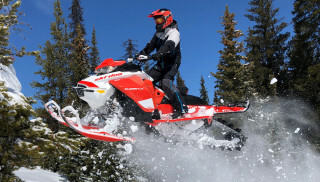 Not only the above mentioned, the shorter tunnel and snow flap prevents the 2020 Ski-Doo Summit X Expert from getting hung up on its tunnel and flap as the suspension and track seeks traction on the steepest and deepest ascent and sidehill swath. A mountain snowmobile’s biggest enemies to climbing and floatation, are the running boards and the tunnel’s tail. The Expert seeks to take these adversities away. This rider, new to Summit ridings, takes the Expert for a maiden flight and found himself, bemused at all easy the Expert was manage. 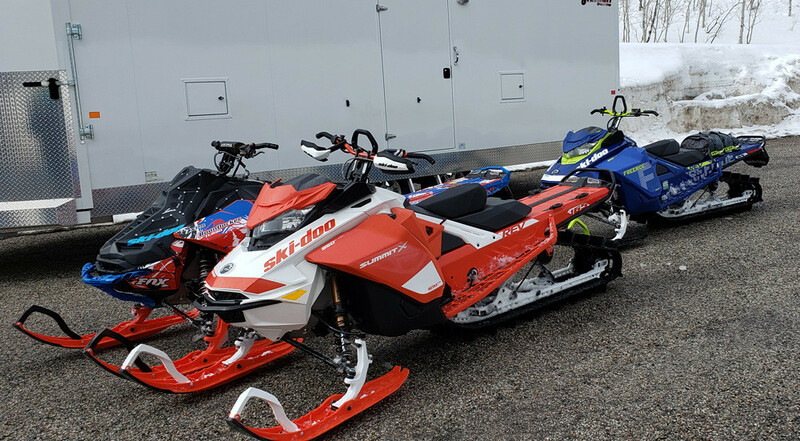 Here is what is interesting about the Expert; it incorporates most what we’ve come to know that is needed to elevate mountain riding by making the snowmobile and its rider freer. For a while now, we’ve come to understand a short post; smaller outside diameter handlebar ends; a narrow, short and not-so-tall seat; reduced height mountain strap; shorter tunnel and minimalist snow flap; make backcountry riding, according to OEM-sponsored experts/athletes, more sustainable and less energy sucking. Back to the short tunnel. The Expert is meant to be a highly-agile and nimble mountain sled. Motor cooling from the shorter tunnel (reduced surface area for motor coolant to travel through) is marginally reduced for and from trail riding. 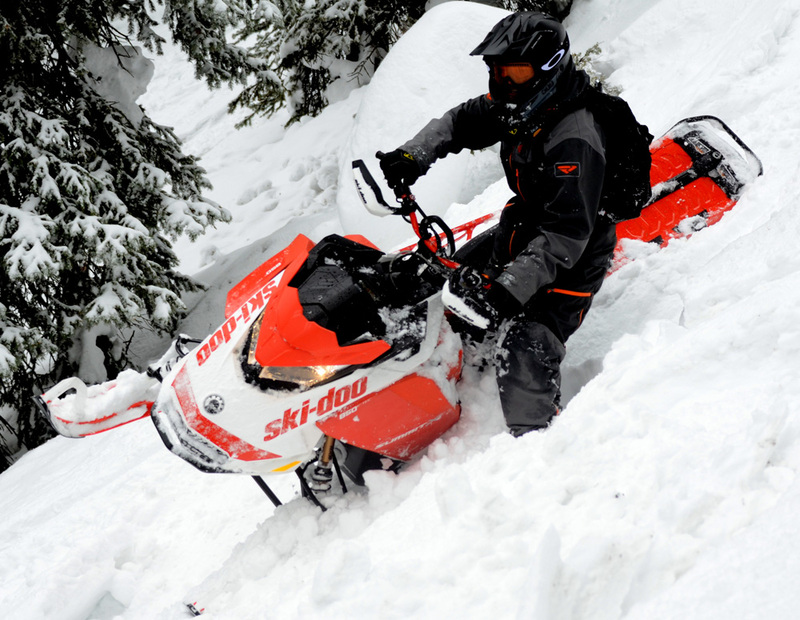 For the most part, mountain riders don’t trail ride, but be motor temperature smart. Coming up and around tree and a fallen tree, the Expert makes the most difficult maneuvers, easy. Lastly, two more niceties. The Expert’s runningboards are now a full extruded aluminum board that has wide snow dump (evacuation) holes up at the toe wells. This is new for 2020 and allows snow to drop and build up at the toe wells. And at the handlebar ends, the ends have a slightly smaller diameter to reduce hand fatigue and increase handlebar end feel for a gloved-hand. The Expert’s purpose is to be lively in the trees in a wicked way, balanced when off-camber and steely in the ravines and gullies. It is not meant to be a difficult vehicle to ride, but one that is easy and feather-light to the touch, while being cutting quarter horse nimble. In all seriousness, you don’t have to be a Ride Rasmussen Style expert, to ride a 2020 Ski-Doo Summit X Expert. This Summit will come to you. It will be obedient and easy to rock from side-to-side. It will not pitch you over bars when hitting a ravine or blow hole head on. Ski-Doo has taken the Summit X, a nearly perfect mountain snowmobile from its inception, and made it even more perfect. When beginning an off-camber maneuver, the Expert with its low bars, allows the driver to properly position their body over the track drivers. Spending a day riding the Expert with Bret Rasmussen was a day where we were stronger and better than normal, thanks mostly, to the Expert’s design, and too, to Rasmussen’s schooling. The Expert gave us the confidence to ride with the Professor, be Schooled, and not cut from this expert team. Here Bret Rasmussen shows his signature wrong-foot forward stance, while low and forward the cab. The Expert, with the expert Professor behind the bars, is fully in its element. This snowmobile does not fight its driver. The Expert is as nearly a perfect mountain sled – we repeat – as we’ve ridden to date. 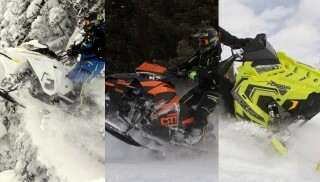 We love new model year snowmobiles as the best keep getting better. 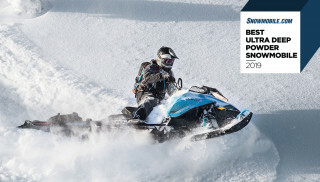 With all this in mind, the 2020 Ski-Doo Summit X Expert is Snowmobile.com’s Mountain Snowmobile of the Year for the 2020 model year.